At Tufel Media, we don’t only use creative ideas, we also incorporate research and analytics. Facebook can be extremely useful for lead-generation and for building a community of loyal fans that are easily converted to loyal customers. It is tempting to look at a company that has a million “likes” and automatically think they must be doing everything right because of the number of likes. BUT if you look closer, right next to the number of likes, you’ll notice the number of people “talking about this”. It doesn’t look good when a company has a lot of likes and very little engagement. The number of likes tells us that someone hit the LIKE button ONCE. The number of people “talking about this” tells us how many people have actually interacted with their content. Interacting with a page’s content can mean liking, sharing, or commenting on a post, zooming on a photo or watching a video. This is why it is crucial to post rich content that people are willing to share with their friends. Tufel Media Digital Marketing has a team of experienced social media managers who know how to generate the highest level of engagement. Our team also understands the fundamentals of marketing and that viral content MUST be brand specific. This is what happens to a Facebook Page when Tufel Media takes over! It went from flat-line to a massive spike. Post Reach is the number of people who saw your posts. Likes, comments and shares will help reach more people. Facebook measures two types of reach — organic and paid. 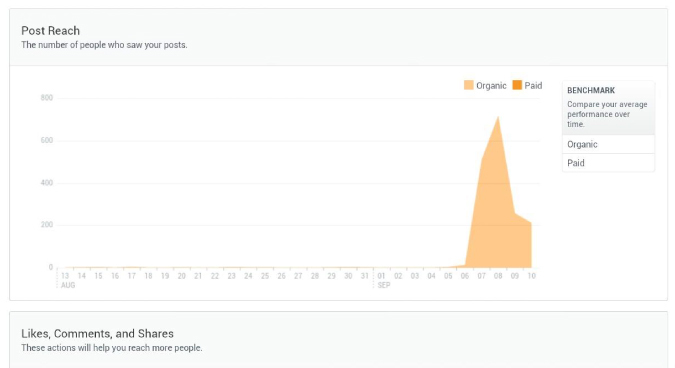 On the photo above you can see that our client’s post reach spiked with organic posts. No pay-per-click ads were necessary. We created a high level of interaction for our client in a cost-effective way. We can do the same for you!